were becoming normal in American homes, electric engines were driving industrial manufacturing and the first world war was ripening its bloody appetite for the heavy metal. The Kennecott was also carrying 40,000 cases of salmon from the Copper River region, treasure of the same color for a different market. In the early 1920’s, powerful industrialist like J.P. Morgan and the Guggenheims were monopolizing the copper industry in the far west and territorial Alaska, where risks were more likely to come from nature than from trust busters and political enemies. 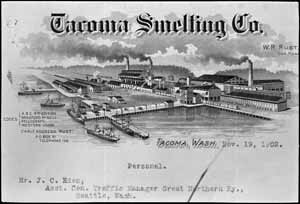 Morgan and the Guggenheim syndicate controlled the Kennecott mines, the Copper River and Northwestern Railroad, that carried ore down river to Cordova, the steamship and freight lines that provided ore transport to Tacoma and the Asarco smelter, which was actually in Ruston, a town they also operated at their will. The shipwreck of the Kennecott, was a metaphor for the tycoon’s worst fears, that forces from the environment- bad weather, depleted mineral deposits, even over harvested fisheries-would be their downfall. Captain “Laughing Jack” Johnson explained the loss of his ship in a hastily written report with the statement,“dirty weather prevented taking sight of sun to ascertain…position.” He and seven of the crew stayed on the beach near the wreck after Coast Guard tugs pulled everyone safely off the sinking vessel. This was his second ship lost off the B.C. coast. In the 1909 wreck of the 343 foot passenger steamship Ohio in Finlayson Channel, four men lost their lives under his command when the hull was torn open on the rocks in heavy rain and darkness. Sea water reached the boilers and the ship exploded. The Kennecott broke up and sank after a failed salvage attempt and on the evening of October 23 Captain Laughing Jack was standing on the deck of the salvage steamer Algerine as it headed south toward Tacoma. As the voyage took him down Finlayson Channel past the site of his first ship wreck, he went overboard, his body never found. Wreck of the M/V Kennecott with signal fire at the stern and bosun’s chair being used for rescue. Morning of October 9, 1923.